Linda McMahon was best known by many WWE fans as the suffering wife of Vince McMahon, and the only one who seemed to be nice, but behind the scenes, Linda served for years as the CEO of the organization and is certainly responsible for a lot of the success that the WWE has had. While much of the WWE’s profits may have been spent on her failed senatorial bids, she was (and is) held in high regard by many of the WWE personnel and the fact that it was she who inducted the Ultimate Warrior to the WWE Hall of Fame reflects it. Although we can make an argument for Vince, Shane, Stephanie and Linda to enter the WWE Hall of Fame on their own, is it not more likely that they will enter as a family? Why they will get in: Her behind the scenes work was essential. That should mean something. Why they won't get in: Realistically, she is unlikely to get in on her own. Her best shot would be as part of the McMahon family. Should Linda McMahon be in the Hall of Fame? Buy your Tickets to see Wwe Nxt at Sands Bethlehem Event Center in Bethlehem, PA HERE for as little as $40! Buy your Tickets to see Wwe Nxt at The Fillmore Philadelphia in Philadelphia, PA HERE for as little as $55! Buy your Tickets to see WWE SummerSlam at Capital One Arena in Washington, DC HERE for as little as $71! 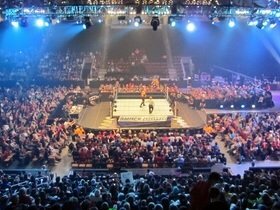 Buy your Tickets to see WWE Live at Mohegan Sun Arena at Casey Plaza in Wilkes Barre, PA HERE for as little as $102! Actually, she wasn't. She was an inductor, not an inductee.